I recently upgraded to iOS 11.1 and none of my songs are giving me the options to play lyrics. Has this feature been removed or the option to display them been changed? This is a known bug in iOS 11.1+ (11.2 and 11.2.5). There is an Apple Discussion with over 1250 users saying they are having that issue. I am not sure if there is an open Radar ticket for this bug. Update: Fixed in iOS 11.4. With the update to iOS 11.1 (I'm not sure exactly when this change landed), the Music app will now contextually show lyrics depending on if they are available. They will show up directly above Up Next Category. You can find the instructions to view lyrics of the currently playing song in the Apple Support Article, View lyrics in Apple Music. Not the answer you're looking for? Browse other questions tagged ios music apple-music music.app . Lyrics for any iOS music? How to play all songs except classical and movie soundtrack music using the Music app on an iPhone? 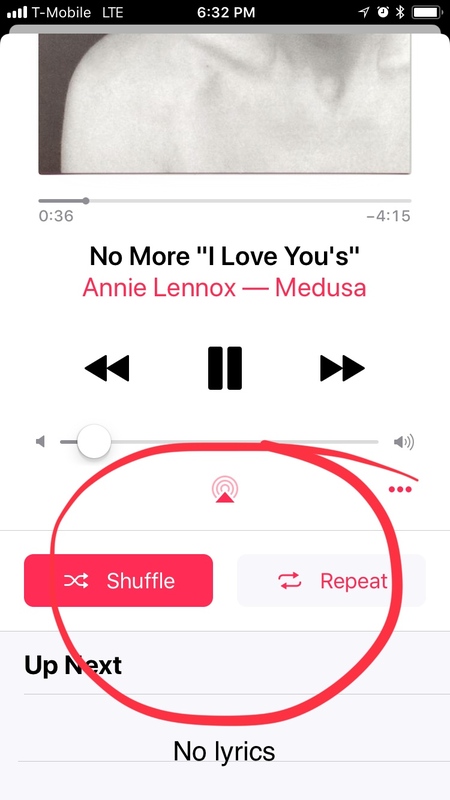 iOS 10 Music App: “Add to up Next”?